It was such a lovely day. 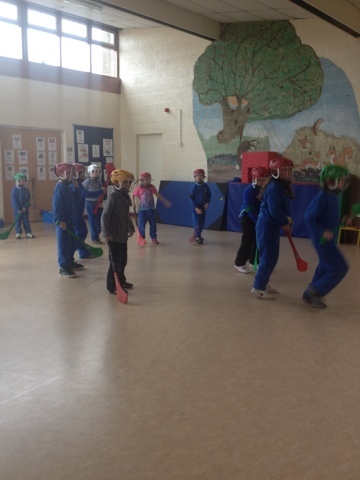 We had PE outside in the clós. We also noticed the flags on the flagpoles. 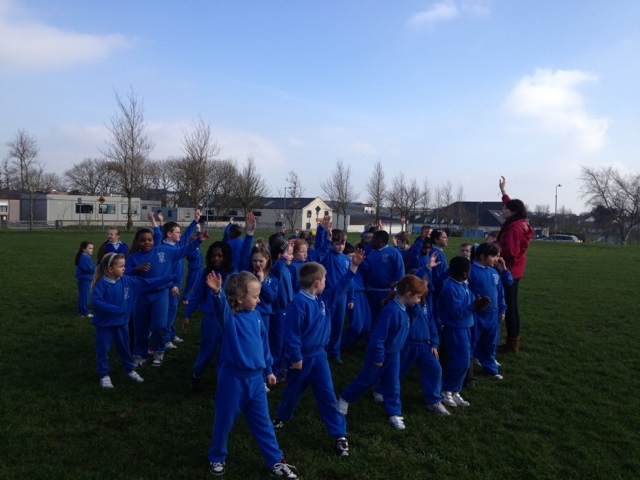 We finally are seeing the sun :) so today we joined Miss Lane's class for PE in the field. 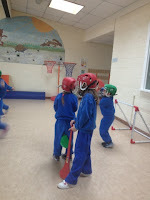 If you love playing hurling or camogie why not come to the Liam Mellows GAA club registration day. or visit the website at www.liammellows.ie and click on "Coaching Scheme"
Some pictures of our match in PE today! 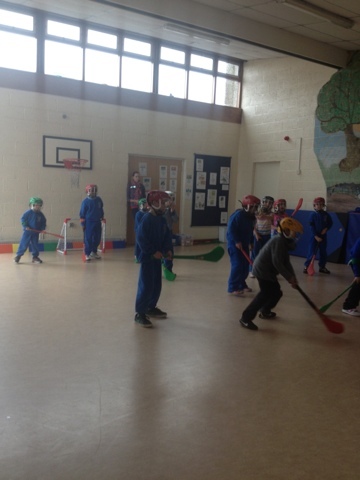 Today David Collins and Tadhg Haran came to visit our class along with our PE teacher Katie. 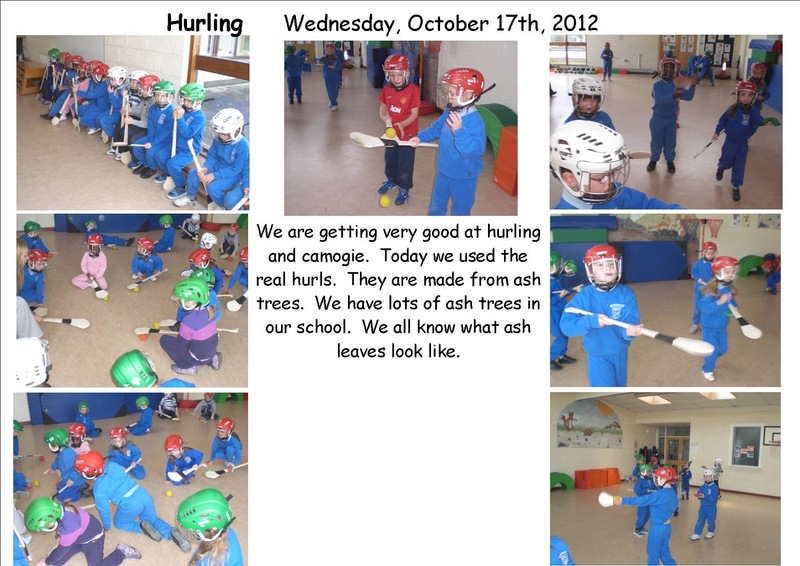 They showed us the cup they won in the Leinster Hurling final. Well done lads, we are really proud of you. Some of us already play hurling or camogie with Liam Mellows club. The rest of us would love to try! We really like dancing along to this song. We are a very fit bunch! 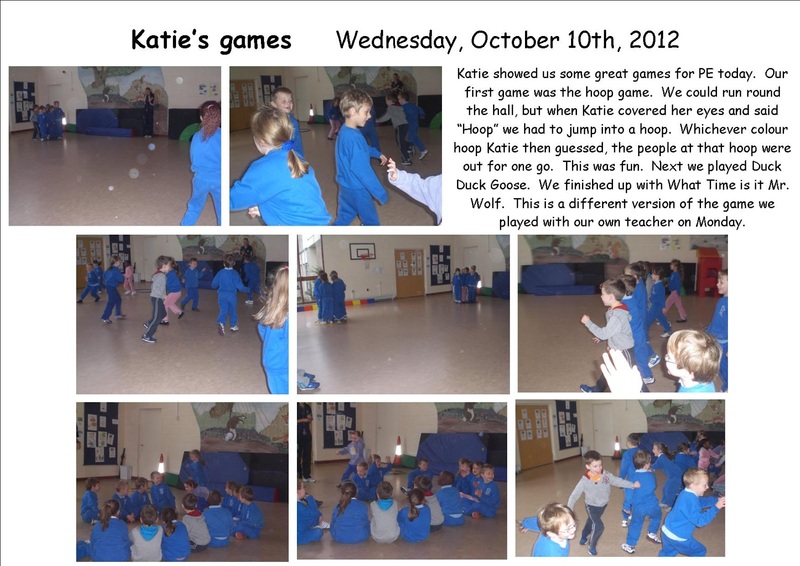 We played games with Katie today. 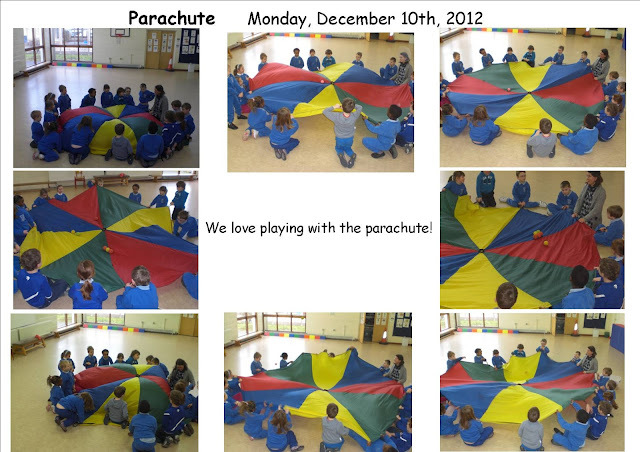 See us playing Stuck in the Mud and Cat and Mouse. We really enjoy our PE classes! 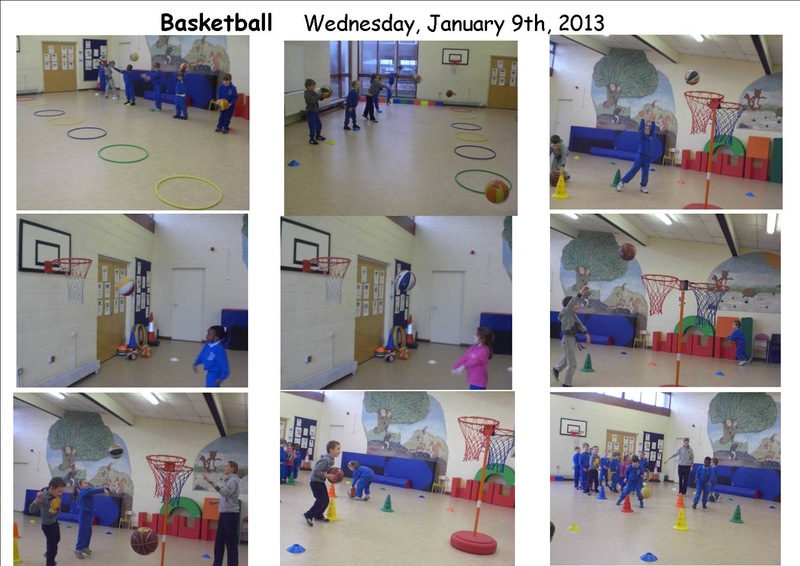 We began with basketball bounce passes. 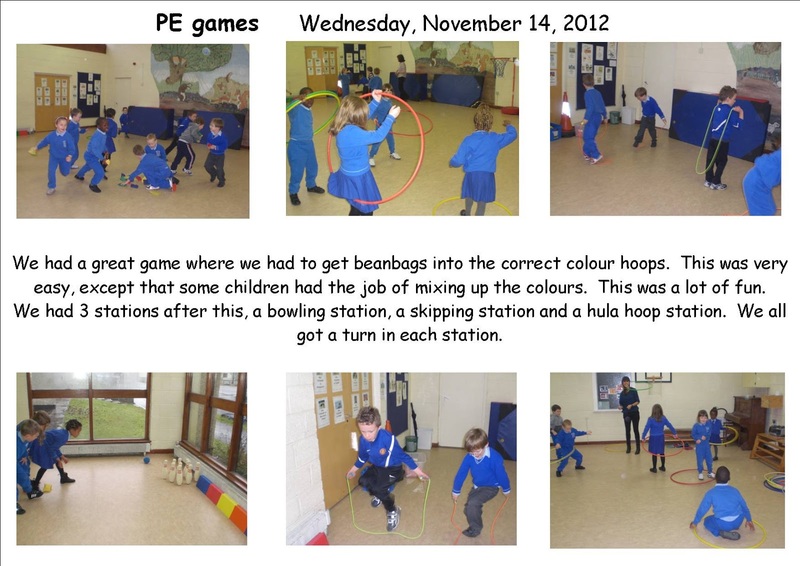 We had to bounce our basketball into the hoop and then to our partners. We had lots of turns to dribble and shoot into the nets. Some of us are really good at this. 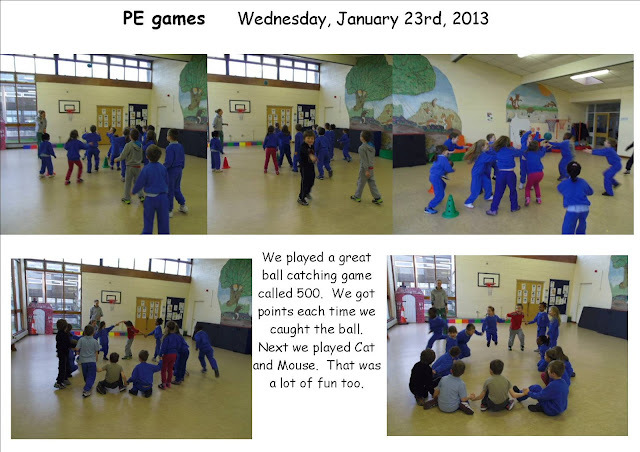 At PE on Mondays we are doing athletics at the moment - lots of running, jumping and relays! After doing lots of interesting floor work, we spent some time balancing on narrow beams, crawling under tunnels and doing interesting rolls. We are getting very good at gymnastics! 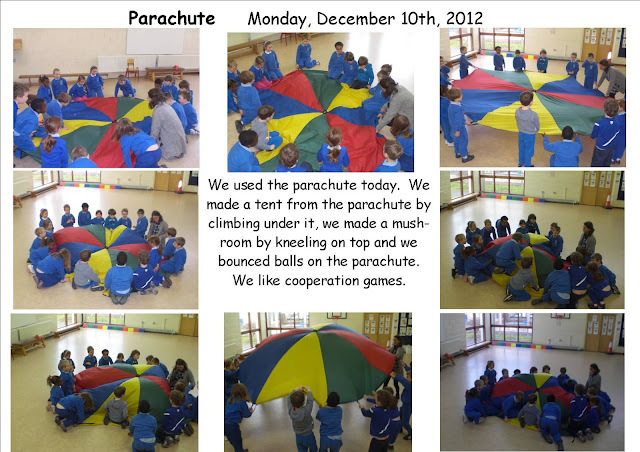 Today at PE we did some gymnastics. 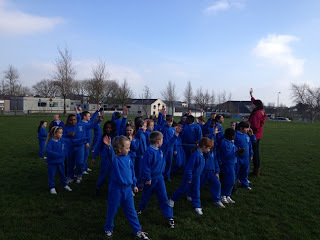 Teacher did the very lively warm up time first of all with us so that we won't get hurt or won't be stiff tomorrow. We concentrated today on rolls and vault. 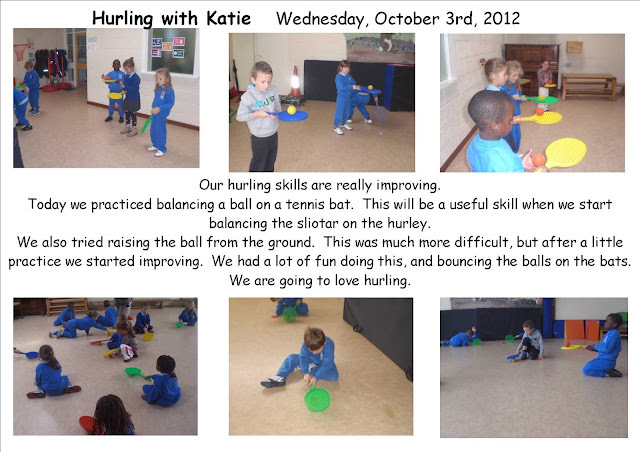 We did pencil rolls and forward rolls. Some of us are very good at this, and some of us need a little more practice. On the vault we did squat jumps onto the vault and straight jumps off the vault, and then we did straddle jumps on and star jumps off the vault. We even presented nicely at the end of each roll or vault. We are combining our monthly theme of "space" with our PE. 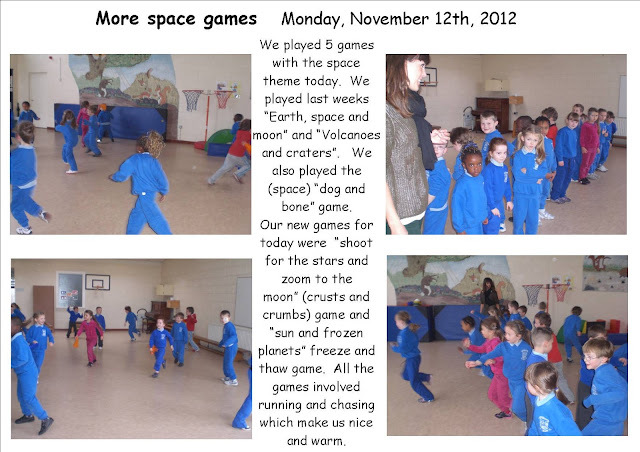 We played two wonderful space games today. Our first game was called Earth and Moon and is played like "Ships Decks and Lifeboats". We had to use our rockets to take off from the moon or Earth, we had to be astronauts on the Earth, in space and on the moon, we had to greet aliens, avoid asteroids and be in the right place at the right time every time. The next game we played was Volcanoes on Venus and Craters on the moon. The boys had the volcanoes and the girls had the craters. Each group had to turn over as many of the other teams markers as they could. This games is rather like saucers and domes which we have played before. We love these space games. 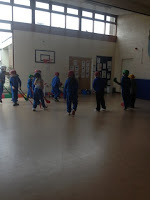 To improve our games skills we practised dribbling the bouncy balls. 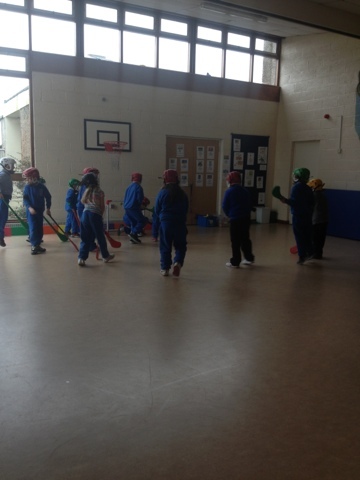 We tried dribbling with our writing hands, with our other hand and with both. We are good, but there is still room for improvement. 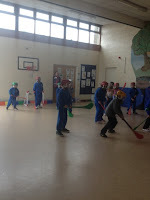 We are learning lots of hurling skills, and we played a great game of hockey today. 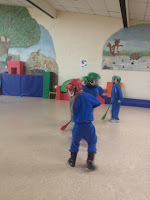 We played a great game of "What Time is it Mrs. Witch/Mr.Wizard". It is like "What Time is it Mr. Wolf?" but it feels more like a Halloween game. When the time is called we have to jump the right number of jumps, and when the witch/wizard calls "dinner time" we have to run back to the start before we are caught. We also played mines. When Katie called a colour we all had to gather at that colour before she counted to 5. When Katie called "pumpkin" we all had to gather at a cone before Katie counted to 5. Anyone not at a colour or a pumpkin before the number 5 was out for one go. We really like these Halloween games. 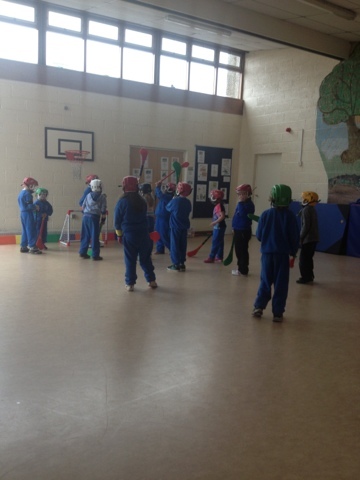 Our PE class started with a great game of "What time is it Mr. Wolf?" 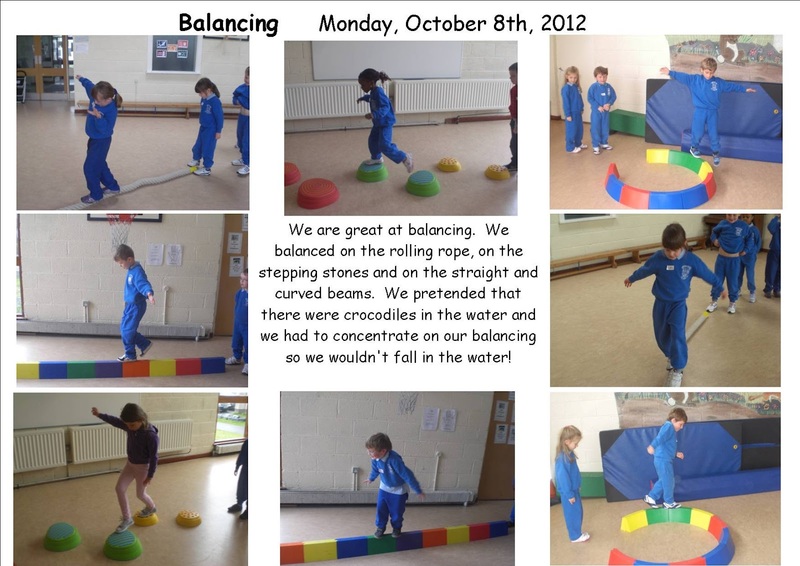 Then on to some great balancing! Most of us dressed in maroon and white clothes today in support of our hurling team. We love wearing our headbands - even when we are working!